Nothing was taken for granted by our ancestors; they utilized what was at hand and economized as much as they could. There was an old joke about how farmers, when they butchered a pig, used everything except the squeal. This item comes from the late 1800s to early 1900s. It is made from the mane of a horse. When the animal died, or had to be 'put down', the farmer would not have simply buried the body. What parts could be used, would have been. The mane and the tail would have provided for some unique things, such as the item exhibited here. 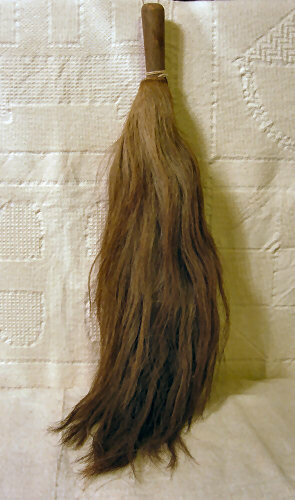 It consists of the mane removed from a dead horse, wrapped around and fastened to a wooden handle. When a farmer plowed his fields, using oxen or horses, the flies tended to bother the animals. Oxen, in particular, would be bothered by insects flying around their eyes. If bothered too much by the flies, oxen might refuse to continue walking. As the farmer guided his team in the plowing, he would engage a young son, or perhaps a daughter if a son wasn't available, to walk alongside the horse or oxen and use one of these 'swishers' to shoo the flies away.